February’s Ecchan is the second to last comic in the series. Next month will be the final one. Can I throw out all my glass bottles and cans on recycling day? No. They are split up into recyclable and non-burnable trash. | What?! How do you know which? The main point is whether food was contained in them or not. | For example, a jar of jam would be recyclable, while a makeup jar would be non-burnable trash! Ecchan #10 is out! This is the January 2012 issue. There’s not much more to say… Night Parade has been keeping me too busy to post much. I’m sure many of you are waiting for an update on the book, so I’m sorry I haven’t been able to give it a decent post in a while. Expect the big announcement on that pretty soon though! When you throw away spray cans, you must poke a hole into them. If you mix them up with other types of trash, when the trash is collected it can be very dangerous! That’s scary! So, when and where should I throw spray cans away? Take it to your trash station on the designated day and throw it in the designated bin! Happy New Year! I meant to upload this post on Christmas, but the end of December flew by me so quickly that it was January before I even knew it! I’m happy to say that The Night Parade of One Hundred Demons is almost finished, and will be published very soon — hopefully within a month. In the meantime, here is last month’s Ecchan comic, and a Santa Ecchan to celebrate the holiday season. A little late, but better late than never! I did find out recently that Ecchan will not be renewed next year. That’s a big disappointment, as I really enjoyed making these. There will still be three more comics (up through March) in this series, but that will be the end of the series, unless it ever gets renewed some time in the future. It’s a little puzzling to me, as city hall has spent so much time, money, and energy trying to reinvent Echizen this year as a) a hot spot for storks, and b) an ecologically restored, clean and green town. Hopefully this just means a change of direction, and not that the move to promote ecology and wildlife was just a one-year fad… but it’s hard to tell with politicians and bureaucrats. It’s now well into November, and I am enjoying the beautiful fall colors here in Japan! Though while the mountains are like huge heaping piles of color that fill up the entire horizon, there’s something to be said on the smaller scale for the lush tree-filled avenues of New Jersey. Even Japan’s rural towns are asphalt jungles, and the only non-paved land is generally used for agriculture, so there are precious few trees in the towns. Oh well, I guess you can’t have it all no matter where you live! This month’s Ecchan comic has been finished and continues the theme of separate trash. Looking at it here I often forget that we’re seeing a slightly incomplete version, as that funny brown bar at the top demonstrates. That empty space is used, along with a large area below the comic, for extra information on the month’s topic. So if it looks strange on this site, that’s normal! Today’s comic doesn’t make much sense on its own, but it headlines an article detailing the proper way to separate plastic trash from other nonburnable trash. “Puragomi…” does that mean plastic garbage? Look, here is the “puragomi” mark! It’s been a quiet month on my blog, primarily due to my yokai book taking up nearly 100% of my time, leaving me none to write here — but also because I’m beginning to see how social networking is making blogs obsolete. It’s a lot easier for me to make a quick post to my Facebook page than it is for me to write up a long, detailed post here. On the same note, interacting with the Facebook page is easier than posting comments on a blog. With that in mind I am pondering the direction to take my blog, as it will definitely need a redesign to coincide with the read of Night Parade. I think the way to go is more integration with social networking services like Facebook, Twitter, and Google+ in order to make communication with fans easier, while using this website as more of a portolio with updates solely about my artwork. This kind of conforms to the way I have been using it in recent months: fewer updates on the blog, but each update will have more substance and be related to my artwork. Other kinds of posts seem more suited to the environment of social networking sites, so you’ll see them on Facebook, Google+ and so on! Anyway, on to the main topic of this post! The October edition of Ecchan. Obviously I wanted to do a Halloween-themed Ecchan, which you can see to the right. The story doesn’t have anything to do with Halloween, but it’s nice to keep up with the seasons somehow, especially considering that Japan is so in-touch with seasonal changes that to let them go by unnoticed seems weird. “My CD player broke, so I bought this! How do we throw this away? Make sure you take out the batteries, and treat them as hazardous garbage! In the meantime, while I can’t show my new yokai paintings on my blog just yet (that’s private for backers of the project), I can show the other art I’m working on at the same time. Here is last month’s issue of Kounotori Ecchan no Eco-na Hanashi. It continues August’s theme of properly disposing of non-burnable garbage, and features a Fukui prefecture staple: the Echizen crab! If your wondering if Japan’s garbage disposal system is really so complicated that it takes months of comic strips just to explain it, the answer is YES! I also did a tsukimi (moon-viewing) Ecchan for the footer text, which you can see to the left! Rubber and leather are also unburnable garbage! Cut long items up into small enough pieces that they won’t get caught in the trash processing machines! You may remember from last year and the year before, around this time, I uploaded a poster for an event called Kiku Chikyu Haku — the Chrysanthemum Earth Festival. This year I designed the poster again, but I went with a very different feeling this time. 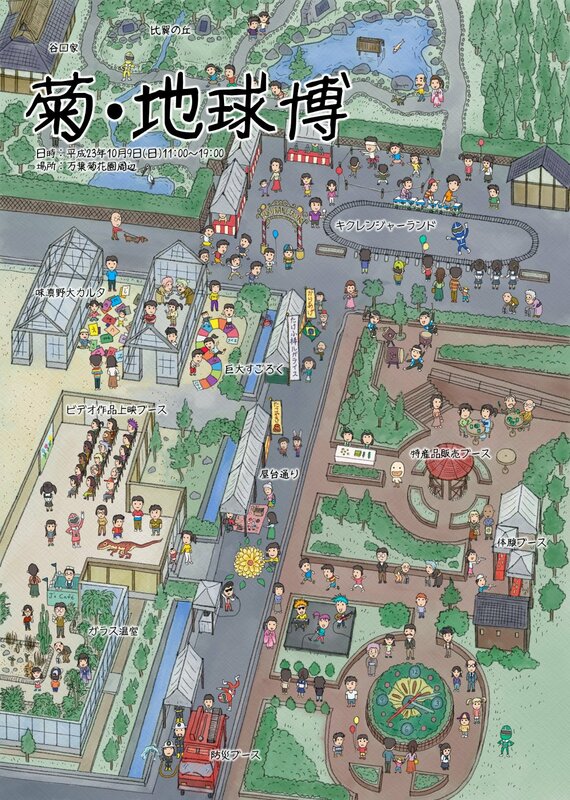 This year they really wanted to reach out to kids, and make the poster reflect that it’s a fun, family event. For the poster this year I went with sort of a Where’s Waldo style poster that also serves as a map of the festival grounds. It was fun to get into all of the minute details, and to add some fun things too, like the 5 “Kiku Rangers,” a Fukuiraptor, an Echizen crab, and Ecchan the stork from my comic series. If you’re in the area on October 9th, please come and enjoy the festival!